Foscarini is an Italian lighting company that views each lamp as a passion project, fueled by an appreciation for and strong understanding of timeless design. Creating unique products that boast a strong personality, Foscarini holds a deep knowledge of the lighting industry and maintains a steadfast reputation. 60 models, more than 20 materials and over 30 designers come together to form a robust collection of lamps, each with a story to tell and an aesthetic that is powerful enough to transform any space, be it public or private, into a distinctive living experience. The Salone for us is like a product you never really stop designing. We see magazines the whole year, we go to fairs of our field and especially of other fields to observe their philosophy, setups, logics. In this way we bring many inputs back home, we see how companies tell their story in the various countries and what they want to highlight: all useful elements to trigger new ideas and help us devise and then design our presence in Milan, which starts six or seven months before the Design Week. In our installations at the Fuorisalone the product is always part of the corps de ballet, but the real show is the ballet itself. The product is used, yet sometimes only in its graphic shape. On other occasions the lamps are built and set up in different ways through videos and animation: despite being there, the lamp is not the focus of the presentation, the opposite of what happens in Euroluce. The Salone represents the rational stage, while the Fuorisalone is the emotional one. Although we always try to offer both aspects inside and outside the Salone, the first is supposed to be more commercial, the second instead is more focused on telling the story of the brand. Our turning point has been “Infinity”, the huge kaleidoscope we made with Vicente Garcia Jimenez in 2009, a setup that was awarded a honourable mention at the Compasso d’Oro. 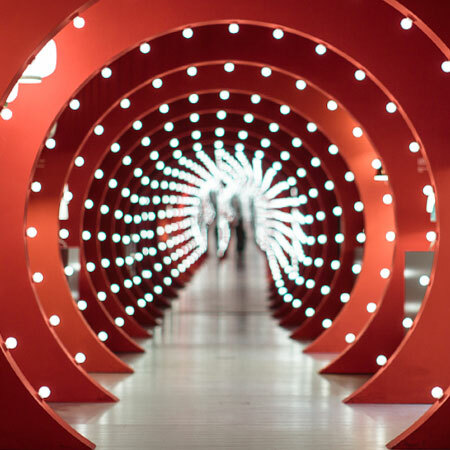 A long, almost 4 metres-tall, triangular section tunnel of mirrors which projected moving pictures graphically recreating our products and reflecting onto the mirrored walls. This installation was able to attract any kind of public and was really successful. It spoke a universal language; it was easy to understand and caught visitors’ attention. We go to the Salone del Mobile every two years, on the occasion of Euroluce. On the contrary, we have been taking part in the Fuorisalone every year since 2005. Our experience started in Zona Tortona, in the years when it was moving from the informal approach of the beginnings to something more structured. In 2013 we decided to open our permanent Space in Brera, to recount the spirit of the brand not only during the Salone week. Since the beginning we’ve thought of Euroluce as a place for design and distribution professionals, while the “Fuori” is a chance for us to meet the public. We have always differentiated and calibrated our participation in these events according to the audience: while the fair requires the best setup to present new things, as these must be understood in detail, in the Fuorisalone we know that we will deal with people already tired who have already seen a thousand things. At the Fuorisalone you must communicate your message focusing on very few concepts and conveying it in a direct and straightforward way. During our years in Zona Tortona we noticed that the public had changed, that it was growing and was more and more interested in the happening rather than in design itself. Many turned their nose up on that, but that was the final customer for me, so I didn’t get shocked like the others. Now in Brera people tend to visit the fair more during the week end, which is not so different from Zona Tortona: many not-so-interested visitors pass by, their eyes already full of images and the challenge is to leave them something in a matter of seconds. People’s ability to keep focused on something is much shorter now, probably due to the Internet. Whether good or bad, visitors must understand in 2 seconds if something is interesting or not. If they find it is and continue going, they will watch the entire showroom in 30 seconds and decide if there’s something they like or not. I am not living in Milan and I am a bit sceptical about Expo. You may call me a romantic, but if I think of the Universal Expositions of the past, Expo looks nothing but a big fair. Nonetheless, what I feel now is that there’s a deeper and wider awareness in Milan and among people living in Milan. It looks like you can do more important things, people are now aware that if you work hard on something, that thing might happen one day. An event like the Salone only exists in Milan. When it comes to occasions that activate people’s neurons, the Salone is among the top ten in my personal rank. The only way to go beyond the Salone was to create the Fuorisalone and Milan offers some preconditions that other cities are unable to offer. First of all, Milan is a small city, which makes it easier to move from an event to the other. Furthermore, it has a cultural background and the typically Italian ability to design and create: many ideas arise here and there are people able to put them into practice at high quality standards. They have tried to do the same in Paris, London and other cities, but these attempts have not turned into significant examples. Every year, the feeling you have in Milan once you are back home is that you haven’t seen enough. I always say: “who knows what I missed this time” …and this only happens in Milan.